I'll take them. Please PM me with payment/paypal info. lonellr and mrscott24 your plugs look great! Beautiful paint and very clean finish. Pencil popper nose shaping jig. How many coats are you doing Punch63? I use e-tex lite as well. Often subsequent coats will smooth out or correct any abnormalities in the first coat. Also, 3 rpm sounds too slow to me, though I have no experience with a motor that slow. Also, looking at you setup the heater may be a problem. If it is a cold environment like your garage or basement, applying the heat predominantly to one side at that slow rpm will dispropartianately heat the one specific part of the plug which faces the heater when it comes around. If thats the case, and its possible, I would bring the setup inside the house and give it a try. Some make enclosed spinners to help with this. I do all my epoxy top coats inside (for dust and temp control). I have a few and they are cool looking but not great reels. 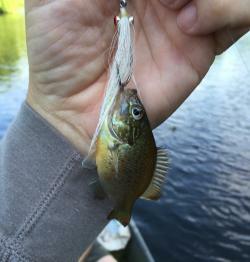 Compared to the Penn Spinfishers made at the same time they are like a toy. Though not very stout it is all metal and very light. Spool is multipiece and the drag is a small single disk. I play with one as a light setup at beach or pier. Fun and works well in this application. Beautiful plugs Kphresh! Just finishing my plugs (pre-paint). Doing something a little different for me so had been in experimental/testing phase for a while. UV Epoxy Resin? Any experience? This stuff looks pretty cool. I found this video where a guy does a demo on a lure with a nice home build UV box. As I am a user of long curing e-tex, looks like a potential game changer. Here's the whole gang together. These are going to do some serious damage! Everyones work is so impressive. I am honored an inspired. Looking forward to the next build. Thanks! I use an acrylic pain pen with a fine tip. Cool idea incorporating the text in the stripes! Your poppers are very nice. Nice cup, slick paint job and nice pop on the move. I am happy to be getting two of them. Thanks!